The MUNNY Game has Been Stepped Up! 64 Colors’ Supermagical Dunny signing tour came to close this past Friday at Kidrobot San Francisco. 64 Colors continued their mythical signing voyage for the new Supermagical Dunny as they enchanted their South Florida fans at Kidrobot Miami last night. KRNY kicked off the 3-day Supermagical Dunny signing tour last night with 64 Colors. TONIGHT! Join us at KRMIA as the signing voyage continues from 6-8pm. Join the mythical adventure of 64 Colors and the new Supermagical Dunny as they go on a signing voyage through Kidrobot NY, MIA and SF, February 22-24. 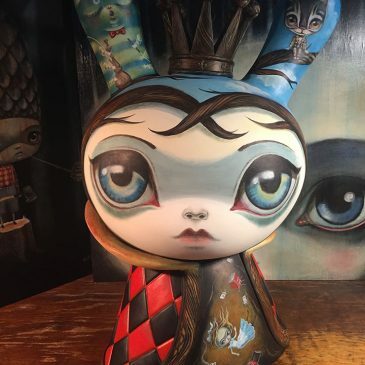 As we make our way to June 23 and count down the days (only 8 to go) to Dunny Series 2011, we present the gorgeous new design, Nature Spirits by 64 Colors. Kidrobot presents the first round of custom FOOMIES and KRACKAS to feature in our stores on April 1. 64 Colors has created yet again, another beautiful custom MEGA MUNNY titled, Insect Inside for the Brick & Mortor Closing at Pink Ghost this Friday.